Karina's Kreations: Thanksgiving treat with the Country Home stamp set! Thanksgiving treat with the Country Home stamp set! Wow your family and friends with this fun Thanksgiving treat. 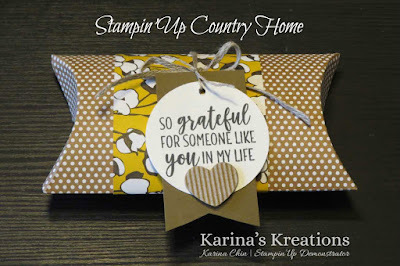 These are so easy to make and uses the new Country Home stamp set. 1. Purchase the Kraft pillow boxes and fill with a treat. 2. Wrap 2-1/2" x 6-1/2" Country Home Designer Series Paper around the pillow box and secure using Tear and Tape Adhesive. 3. Stamp the greeting with the Country Home stamp set and Black Memento ink on Whisper White card stock. Punch out with the 2" circle punch. 4. Attach the greeting to 1-1/2" x 2-3/4" Soft Suede card stock. Cut a pennant shape from the tag using paper snips. 5. Punch a hole with the 1/8" hand held circle punch. 6. Tie 3/16" Braided Linen Thread around the box. Attach the tag using Linen Thread.